For this article we will use the site swimmingpool.com and poolsupplyworld.com for our example domains. Use the Organic Research Competitors report to see all of the websites that frequently compete with your site for website traffic on organic search results. If you want to improve SEO, this will show you your site’s top SEO competitors that you need to worry about. The report is simple - just enter your domain name in the search bar (making sure you are under Organic Research and find the Competitors tab) and SEMrush will list all of the sites that compete for the same keywords as the queried domain - based on common keywords and having a similar total organic keyword count. For more info on how to use this report, read the user manual. To compare the exact similarities and differences between these competing domains’ organic keywords, you can use the Keyword Gap. 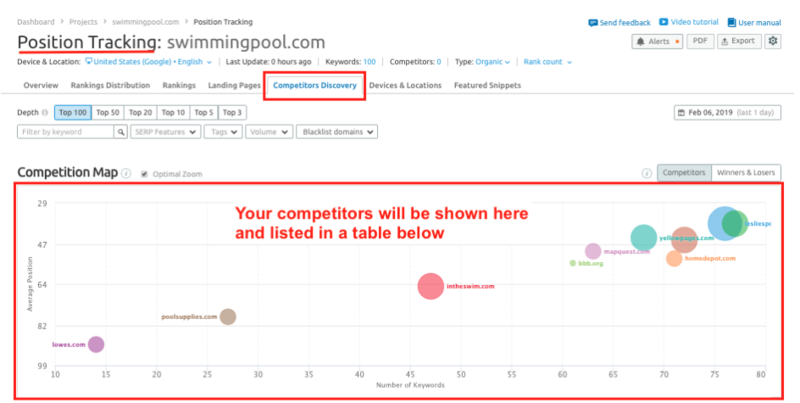 If you are working on a new website and don’t have any keyword rankings yet but you have a list of target keywords, you can use Position Tracking’s Competitors Discovery report to find the top competitors based on your keyword list. Use the Backlinks Competitors report to find the websites that have the most shared referring domains in their backlink profile as your site. The reasons you would want to know your competitors based on backlinks is if you want to improve your SEO with link building. The report works very simply - go to Backlinks Analytics, enter your domain, and click on the “Competitors” tab. This will present the queried domain’s top competitors based on shared backlinks and referring domains. Once you find out your site’s top competitors, you can look for new link building opportunities to build links to your own site based on who is linking to your competitors. For more on this report check out the user manual. If you want to find the exact similarities and differences between backlink profiles from all of these sites, you can enter them into the Backlink Gap. Here you can identify the backlinks that your competitors have that you don’t and make plans to acquire your own unique backlink from those sites. Go to the Advertising Research Competitors report to find the websites that are competing with your site the most among Google’s PPC Google Ads results. This report works very similarly to the Organic Research Competitors report in that it measures competition level of websites by their shared paid keywords and similarity in total paid keyword count. 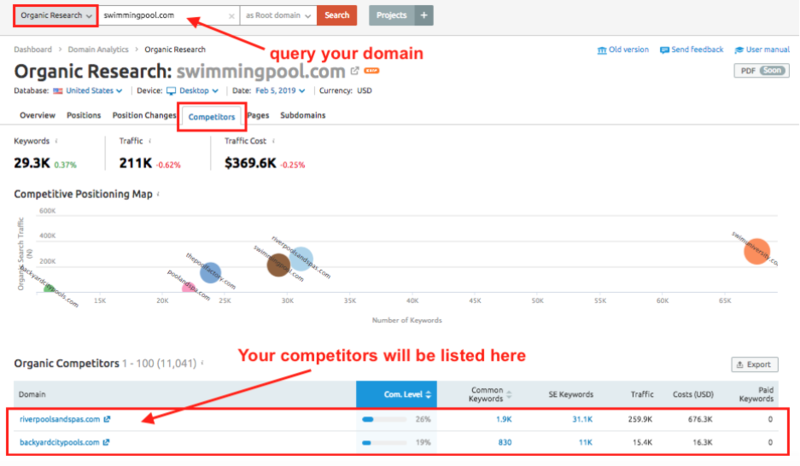 Enter your domain name under Advertising Research and click on the Competitors tab to get the report. If you want to improve the performance of your PPC campaigns, this report will show you the competitors you can analyze in SEMrush to get more ideas and build your own strategy to outperform theirs. For more, check out the user manual. Once you’ve found your top advertising competitors, you can also compare keyword profiles and find gaps using the Keyword Gap tool and adding the filter for paid keywords. Another way to find advertising competitors is with the PLA Competitors report. PLA stands for Product Listings Ads and this report will show you which sites are competing with your site the most among Google Shopping results. 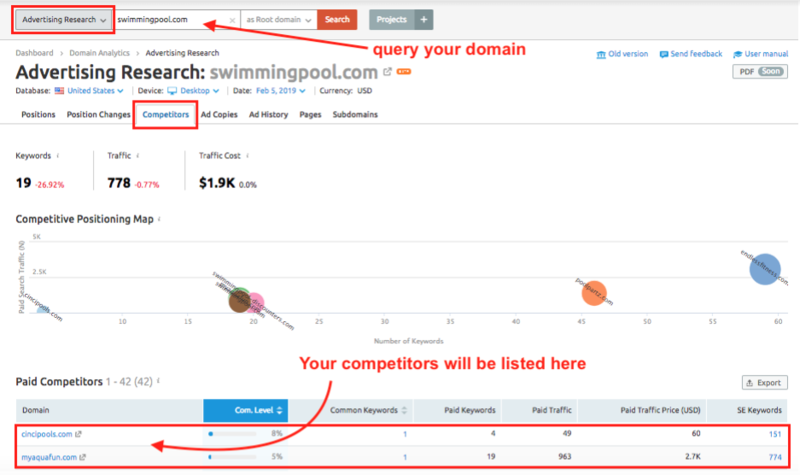 Make sure you are under PLA Research when you query the domain and select the Competitors tab. For more on how to use our PLA reports to improve your Google Shopping campaigns, check out the user manual. You can also compare PLA keyword profiles and find gaps in your competition’s Google Shopping strategies using the Keyword Gap tool and adding the filter for PLA keywords. Now, if you don’t have any rankings yet but you have a list of target keywords, you can find out who your top competitors for those keywords will be by setting up a Position Tracking campaign. Add your target keywords and location to start the tool. For help with configuration, read the user manual. Navigate to the Competitors Discovery tab and monitor the domains that appear in this report over time. These are the sites currently with the most visibility for your list of target keywords in the selected location. For more help on using the Competitors Discovery report in Position Tracking, read the user manual.